Target Niche Customers with the Opt In Emails to get the Desired Results. Click2Connect Solutions campaign managers have the process and systems to set up and execute your campaigns flawlessly. In many cases, we are able to be more cost efficient than an in-house team, because of efficiencies of scale. If you already have a team in place, use us for spill-over's when you have a busy campaign season like a new product launch or holidays. We offer Email Marketing in India with highest deliverability rate with the help of established relations with the major ISPs. 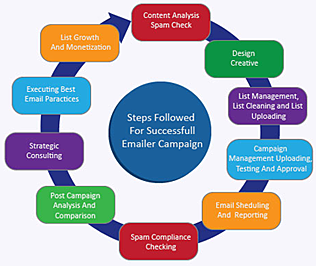 We have expertise in creating, sending email campaigns with advanced reporting, message scheduling, the ability to create unlimited interest groups, bounce back handling, an auto responder, list segmentation, subscription management, among many other major industry-standard features. Email marketing in India is used for brand promotion, lead generation, e-newsletter, market research etc.